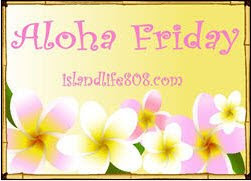 says "In Hawaii, Aloha Friday is the day that we take it easy and look forward to the weekend. So I thought that on Fridays I would take it easy on posting, too. Therefore, I’ll ask a simple question for you to answer. Nothing that requires a lengthy response." Sadly, I do not. The only time I get them checked is when I go to the doctor. That is horrible. I REALLY need to start doing that! Doing another test to see if this thing will let me comment on my own blog since I can't seem to edit from my blog page. Only the dashboard and gosh#$K#$ why is it so hard to contact google or blogger????????????? Sues2u2, you crack me up. I've never done an exam in my life. But I'm young and ignorant, so I guess that's my excuse! I never do it... I know it's bad, but... maybe I'll start this month ! Unfortunately, I don't do it often enough. I always forget. If I forget, then Hubby does it for me. He's pretty good like that. Not weekly, but I check when a light bulb goes off...Oh yeah! It's been a while! As a nursing mother is is hard to really do an exam, but I try to every so often. I probably did it once or twice in my whole adulthood..i should go get a check up with my doctor tough..at least once in my life do it the right way!Thanks for reminding me! No I do not. I know I should, but as I told my doctor I think I feel things and then I worry and have tests and it is better off for me not to and to go to the doctor to check.